SkySignature is an online Digital Signature application. Fast, Easy and straight forward. Free for personal use. Very flexible and intuitive. 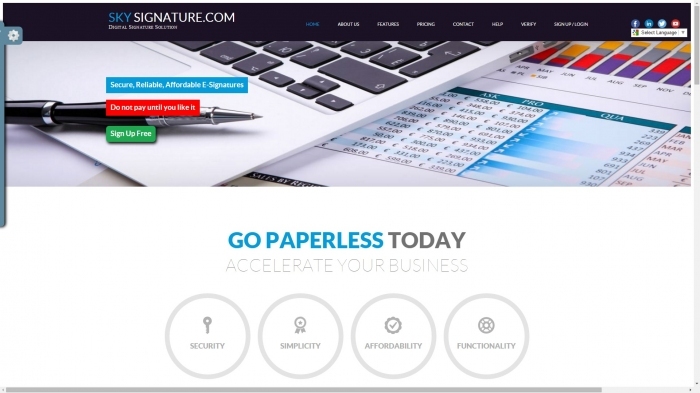 It is fully loaded with many helpful features and PDF editing tools such"type anywhere" capability available exclusively only on SkySignature.com. More features suchSign-Here tags that can be dragged and dropped onto the document. Allows to create a new PDF document out of the individual pages from existing PDF Documents. SkySignature uses a custom, unique advanced encryption algorithm to ensure security. Visit www.skysignature.com to sign up for free and discover how easy it is to sign a document online.